Montana is already playing without their star PG, Will Cherry. Four minutes into the game, they were playing without their other star for a while, as Kareem Jamar picked up his second foul and sat the rest of the half. Four minutes after that, their other experienced returner, Mathias Ward, picked up his second foul and sat for the rest of the half. So it went all night for Wayne Tinkle and Montana, who battled foul trouble all game and seemed to be doing all they could possibly do to grind it out. For a half, it worked, as they went into the intermission ahead 34-27. At the break, CSU was outrebounding Montana 21-10, and that included a 14-1 edge in offensive rebounds. They couldn't buy a bucket in the paint, but they got a ton of chances. After halftime, it was back and forth, but the Rams just had too much size. Colton Iverson was physically too strong for Montana's bigs, and it showed. He finished with an efficient 18 and 8, and was simply overpowering. Greg Smith also seemed to get almost any shot he wanted down low, finishing with 11. Pierce Hornung had 16 rebounds for CSU, playing with the flu, according to Larry Eustachy. I don't want to dwell on it but it should be mentioned... Montana was not pleased at all with the refs in this game. At one point Tinkle actively looked like he was trying to get a technical, but the refs didn't call one on him. At another point it looked like he was going to take off his tie in frustration. Montana lost four guys to fouling out, and had 20 fouls called on them in the second half (33 for the game), and it was not a case of cheap fouls at the end of the game. CSU shot 41 free throws in the game, compared to 23 for Montana. In part, it makes sense because of the size difference, but I have to say there was a lot of questionable, ticky tack calls that went against the Grizzlies. On the other hand, Larry Eustachy wasn't thrilled with the refs either... he said after the game that one thing he has always hated about basketball was that guys can be out of the game on a judgment call, and he was referring to a couple of the late fouls on Wes Eikmeier, who also fouled out. That said, Montana didn't lose the game because of the reffing, they lost because the Rams were simply superior down low. A 44-21 rebounding disadvantage is almost impossible to overcome. The Grizzlies almost did, but the wear and tear was too much by the end of the game. 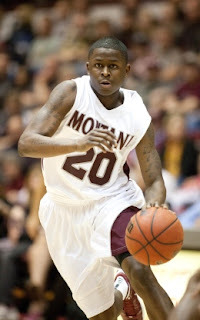 If you are Montana staff, one thing they have to be excited about is the play of the young guard. Simply put, on a night when Kareem Jamar and Mathias Ward were not big factors (aside from the foul trouble, CSU put bigger guys on Jamar and were quick to help, which didn't give him many looks), Keron DeShields and Jordan Gregory kept the Grizzlies in the game. Before the year, Tinkle said that DeShields had a ton of confidence, which could be a good or bad thing. On Friday night, both sides were on display, but the good far outweighed the bad. He forced a couple shots early in the shot clock, but other than that played an outstanding game. They are simply a tough team when he is on the court, and he brings a swagger to his game. He had 17, and was fearless taking it to the hoop, often at times when he was one of the few Grizzlies to stay aggressive offensively. Jordan Gregory hit some big shots from the outside, and generally made good decisions. The two combined to have 0 turnovers. The duo also played great defensively, holding Wes Eikmeier and Dorian Green (two really good players) to 6/19 shooting. Tinkle needed at least one of them to step up in the absense of Will Cherry, and it appears that both of them are up to the task. Spencer Coleman was another guy that had a big impact once he got in the flow of the game, but he was also struck by foul trouble. The bottom line for Montana is this... Colorado State is a tournament team. Their top six is really excellent, and their frontline can match up with almost anyone in the country. There are no Colton Iverson's in the Big Sky. It was a tough loss for the Grizzlies, but they played well, and they have a lot to build on after this game. If you had told most Montana fans that Jamar and Ward would combine for 14 points and play just 40 minutes between them, most would have expected the game to be more out of hand. That it was anyone's ballgame up to the very end is a testament to the program and system that Wayne Tinkle has in place.